Recycled Christmas decorations – our favourite ideas | How can I recycle this? 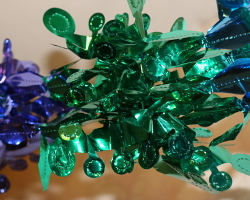 Wondering how to make your festive season that bit greener by making recycled Christmas decorations? There are lots of ways to make them reusing waste paper, scrap fabric, or random other things from around the home and garden – and they’re certainly not all just for kids. If you fancy something a little shinier, make stars from old foil cake or pie tins instead. Or if you prefer your stars in a classy matte, how about making these Christmas fairy light shades from old brown/manila envelopes? Brown paper shopping bags – particularly ones with a Christmas themed print on them – can be made into decorative Christmas stockings. Or if you’d prefer to have fabric stockings to stuff full of treats, how about recycling a pair of old jeans for a modern look? Smaller scraps of old clothes or fabric can be upcycled into scrap fabric wreaths – these ones made from scraps of old felted wool clothes are just lovely. If you’re more of a paper person, this origami Christmas wreath could be made with coloured waste paper – envelopes from Christmas cards for example. Or if buttons are more your thing (mmm, buttons), you could make this fab wreath instead – if you loosely sewed the buttons onto the card, you could snip them off to reuse as buttons as you needed them for actual buttoning purposes! If all these are a bit too grown up for you – or you’d like a project to keep the kids busy while you’re assisting Santa, how about using wine corks to make reindeer tree decorations? Or if you’ve still got last year’s Christmas cards, they could use them to make a cute bunting banner. Finally, a couple of our favourite ideas for revamping existing decorations that are getting old or tired: I love the look of these fabric wrapped Christmas items (I’ve done a similar thing before with a single colour frogged yarn – very pleasant). Or, turn plain baubles into fun (angry!) characters with a little paint. i saw a great decoration on a blog yesterday. 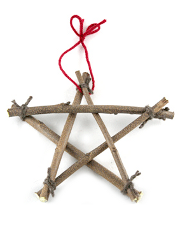 It was a wreath made from fresh bayleaves, which dry out over the christmas period and can be used for cooking afterwards. It looked so pretty. I made christmas floppies a few years ago. I simply used a gold paint spray on old floppy disks – then hung them where ever needed, around desk at work and on xmas tree etc. For gift wrappers, this year one of my ideas is to use Korean newspapers. We picked some from one of our favorite restaurants, and for the non-speakers (like me) the text just looks awesome. A friend’s mom had a tiny tree on her kitchen counter-she had hung cookie cutters on it! Was very cute, one could add other kitcheny things, like tiny spoons. And plastic toys and small stuffed animals are cheery. Hmm, speaking of ribbon-make bows. Or use scrap fabric and make bows. Make a lot, put them all over a tree to fill in space and look pretty. How about painting a broken lightbulb and using it as a chrismas decoration. The shape and weight are right, it would just need a little disguising. We used to carefully crack walnuts, leave a message inside, glue them shut with a string loop for hanging and decorate them. The messages could be read years later for inspiration or laughs. We also made nests, cradles and baskets out of cracked nuts as well. Some of my favorite Christmas projects include jewelry making and ornament making from paper beads. You have some great ideas- I can’t wait to get started on a couple of them. Money may be tight but that doesn’t mean you can’t have a festive Christmas. The whole family can get involved and have some family time. I particularly like the button wreath. Awesome I got amazing ideas for my kids to make thanks !!!!!!!!!!!!!!! !